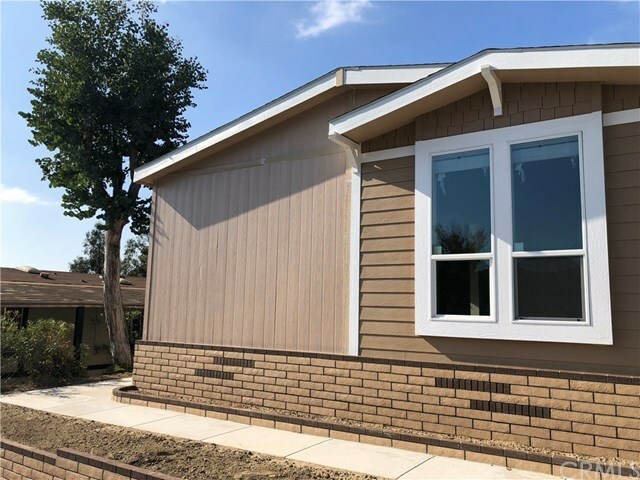 Beautiful BRAND NEW manufactured home! Built by Cavco with a factory warranty. 3 bedrooms and 2 bathrooms. Split floorpan with master bedroom in rear of home with great serene views of the hills and trees. Beautiful Master Tiled Shower. Master bath has a vanity area and lighted mirrors. Large island in center of kitchen with 9 foot flat ceilings. 8 foot dual pane windows and Stainless steel appliances. Pocket doors between guest bathroom and bedroom allowing for another separate suite. Large walk in closets allowing for more storage space. Large open floor plan. Central A/C and Shed included. Pick out your own flooring. View of the hills from covered deck. Located with a private ravine area behind home with serene setting. Ideally positioned to enjoy the proximity to beaches, cafes, theaters, restaurants, shopping center, and a selection of schools, entertainment and close to public transportation. Quick bike ride to the sands of Doheny Beach, Dana Point Harbor also enjoying the hills and canyon views while hiking or walking on nearby trails. Living in this affordable pet-friendly community is like living everyday in Paradise! Donât miss out on this opportunity of home ownership in a Rent Controlled City. Call for any additional information or viewing of this fantastic property!